The summer sun is fading as the year grows old. And darker days are drawing near. Here's a photo from 1937 that is just as much real today as it was then. During the Great Depression propaganda was used to raise spirits among the citizenry, like this billboard created by Arthur Rothstein in February 1937. In this case, the billboard is shown in Louisville, Kentucky, just after a massive flood ravaged the city. Seventy percent of Louisville was submerged under river flood waters, and it was almost entirely lower income, lower class neighbourhoods that were impacted. The photograph was taken by the legendary Margaret Bourke-White for Life magazine. Her image shows people in line for aid, in front of the billboard. They are all African-Americans, bundled up in layers of clothing to protect against the cold. They are flood refugees and many are living with the knowledge that they have lost everything. Rothstein's propaganda poster shows an ideal of the US that reveals the prevailing ideology of the time. A perfect nuclear family, complete with dog. What's good for General Motors is good for the US. 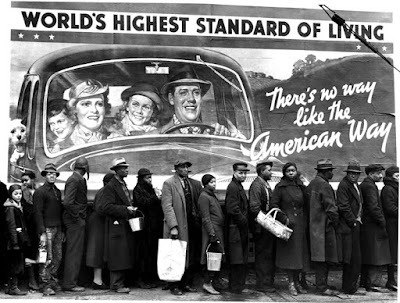 Bourke-White's photo suggests a huge disparity between the reality and the propaganda. Has anything really changed since 1937? Is national greatness measured by how the wealthiest of a nation live, or by how that same society looks after its poorest citizens? Years ago I spent the better part of an evening with Tommy Douglas. At the time I was President of the Young Fellows Club of Weyburn and it was our 60th anniversary. 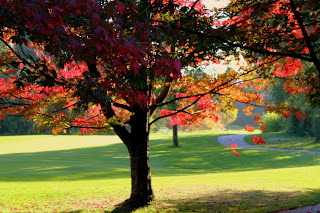 The Club began as a service organisation formed in 1922 and it was a place of fellowship and community action for young guys mainly in their 20s and 30s. 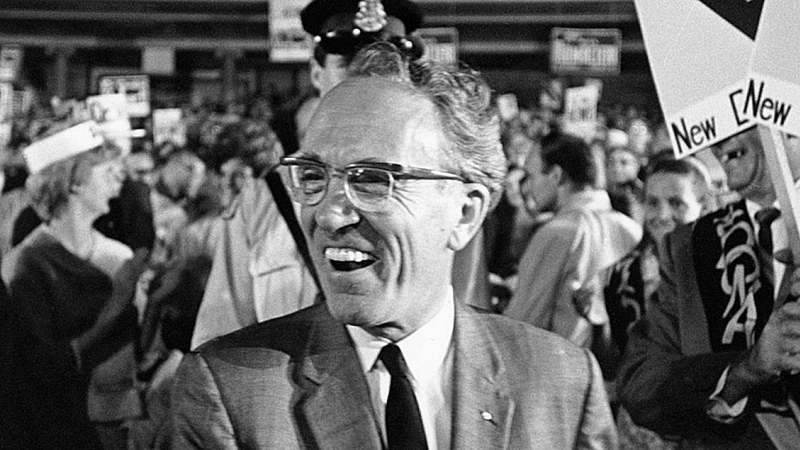 My father had been a member and so had Tommy Douglas, and they knew each other well apparently, though my dad was never a member of the NDP. 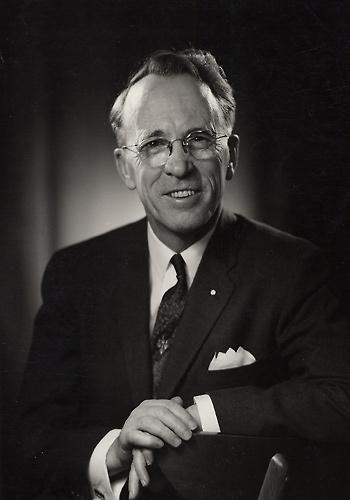 To highlight our Club's 60th Anniversary, and thinking big, we decided to write a letter to our most famous member, and invite Tommy Douglas to be the keynote speaker at our gala evening celebration. Tommy had retired from politics by this time and was living on Vancouver Island, and he surprised more than just a few of us by saying: yes. Sitting at the head table I had Tommy Douglas on one side of me, and our local MLA, a Conservative, on the other. I kept calling our special guest Mr. Douglas and he kept telling me to call him Tommy. "Your dad called me Tommy, so should you." "But you two were about the same age Mr. Douglas." And we both laughed. The Young Fellows Club is a group of young men dedicated to making a difference in their community, through service and by creating better citizens of themselves. It's not hard to see why Tommy Douglas was a member. We had invited Tommy to tell us stories, and he didn't disappoint. He was a master storyteller, spinning yarns that softened hearts and fired up the belly. The message was always constant, his beliefs rooted in an earlier version of Liberation Theology. 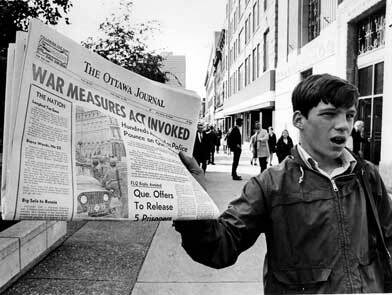 Twelve years earlier, Tommy Douglas spoke out against the War Measures Act invoked by Pierre Trudeau during the October Crisis of 1970. 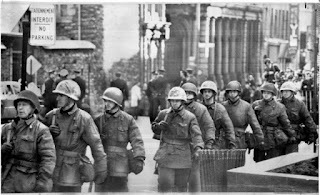 At the time it was a courageous stand; few Canadians were willing to go against the draconian measures Trudeau and the Liberals unleashed upon the people of Quebec. I was a teenager in 1970 and Tommy's stand influenced me greatly in ways I only began to appreciate much later. That night in Weyburn, I thanked him for his stand twelve years earlier, and we talked, however briefly, about the loneliness of standing for what is right when everyone says you're wrong. A few years after his brief return to Weyburn, Tommy passed away. Today, October 20th, is his birthday. "We are all in this world together, and the only test of our character that matters is how we look after the least fortunate among us. How we look after each other, not how we look after ourselves. That's all that really matters, I think." Saint-Boniface has a old world charm all its own, and features historical landmarks like l'Hôtel de Ville de Saint-Boniface, Université de Saint-Boniface and Cathédrale de Saint-Boniface. The Université de Saint-Boniface is a French language post-secondary institution affiliated with the University of Manitoba. Its origins date back to 1818 and it is Western Canada's oldest post-secondary educational institution. A stone's throw from the university is Cathédrale de Saint-Boniface, which also dates to the early 1800s when it actually took the shape and style of a log chapel. The first cathedral was built in 1832 and it was destroyed by fire in 1860. Rebuilt a few years later, it was replaced in 1906, and that building was largely destroyed by fire in 1968. Today only the façade, sacristy, and the walls of the old church remain. Within the cemetery of the old church we found the tombstone of one of Canada's greatest politicians, Louis Riel. Riel was born in Saint-Boniface in 1844. It is a rather unassuming resting place for the founder of a Canadian province, indeed for one so much involved in the early history of our nation. Louis David Riel was the political leader of the Métis people of the Canadian prairies and he led two resistance movements against the Canadian government and its first prime minister, Sir John A. Macdonald. Riel sought to preserve Métis rights and culture as their homelands in the North-West came under Canadian influence.The provisional government established by Riel ultimately led to the terms by which Manitoba entered Confederation as a province. But there were complications, including the execution of an anglophone soldier, and Riel went into exile south of the border. In 1884 Riel was called upon by Métis leaders in Saskatchewan to voice their grievances to the federal government in Ottawa. Instead he organised a resistance movement that escalated into a full scale military confrontation: the North-West Rebellion of 1885. 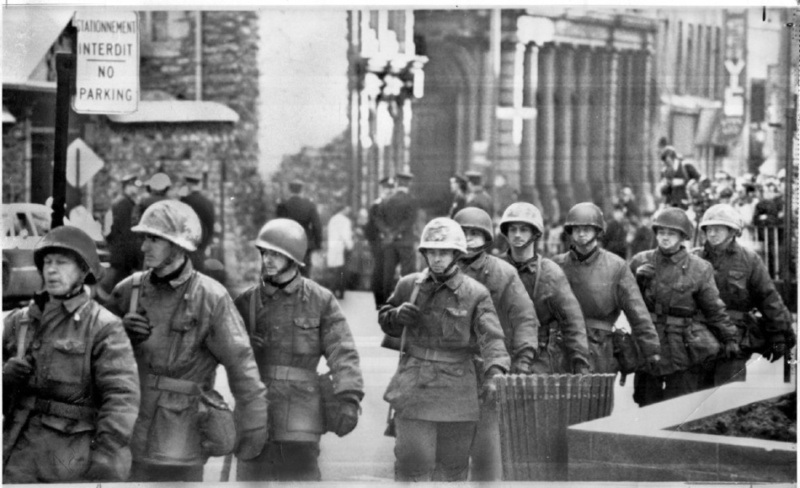 Canada used the new Canadian Pacific rail lines to send in thousands of combat soldiers. 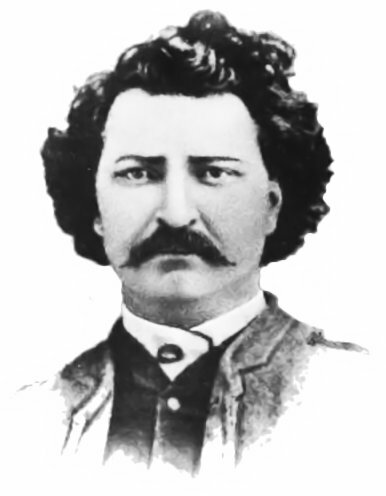 The rebellion ended with Riel's arrest and conviction for high treason. Rejecting many protests and appeals, Prime Minister John A. Macdonald decided to execute Riel by hanging. 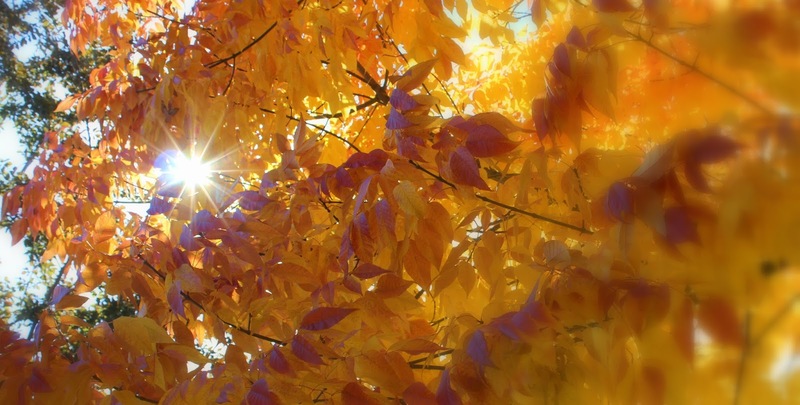 The order was carried out on November 16, 1885, in Regina. Riel was portrayed for years in history classes as a crazy religious fanatic and a traitor against the Canadian nation, but that view has changed over time. He is now seen as a heroic leader who fought to protect francophone rights from the unfair actions of an anglophone central government. Sometimes seen now as a Father of Confederation, he was in fact fiercely committed to Métis nationalism and political independence. Fascinating stuff. And if ever you find yourself in Winnipeg, see the Museum, but also walk around Saint-Boniface and see all that it offers, including the amazing story of Louis Riel. Along busy boulevard Provencher, and just over the pedestrian bridge that connects Winnipeg with St. Boniface, is a delightful coffee shop called Café Postal. It's small, en français of course (about ten percent of Winnipeg's 750,000 people speak French), and it serves Pilot Coffee. The beans are ground and weighed for every espresso drink. 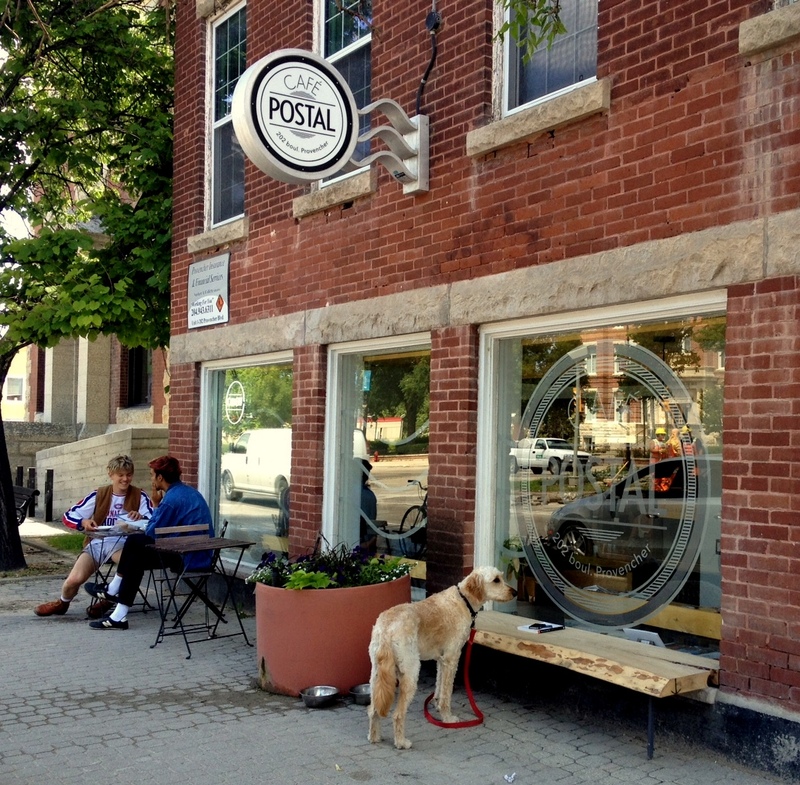 Friendly and inviting, Café Postal gives off a gentle feel-good vibe. There's indoor or outdoor seating, which makes this is great spot to stop and regroup after visiting the Museum of Human Rights across the river. And after a visit to that place (the story of human rights is one of misery on a grand scale) a good strong coffee is just what you need.